(Bloomberg) -- Donald Trump’s presidential campaign warmly welcomed Russia’s help in digging up dirt on his opponent Hillary Clinton. And Russian individuals made multiple offers to help Trump’s campaign. But none of that amounted to conspiracy or coordination by the campaign, Special Counsel Robert Mueller concluded after 22 months of investigation, more than 2,800 subpoenas and interviews of some 500 witnesses. The collusion findings, which were briefly summarized Sunday by Attorney General William Barr, are a victory for President Trump, who has repeatedly called the investigation a "witch hunt." They are certain to disappoint Trump’s many critics, who believed that a damning report could serve as a springboard for his impeachment and removal from office. Mueller’s central mission was to determine if Russia interfered in the election and whether Trump’s campaign coordinated. Along the way, he charged 34 people with crimes, including seven who pleaded guilty and 26 Russians. Prosecutors have charged one group of Russians with hacking emails from Clinton and other Democrats, and another group with spreading disinformation through a social media campaign. But until the release of Barr’s letter, an open question remained whether he would conclude whether Trump’s campaign tried to coordinate with Russia. Barr answered with a resounding no. “The special counsel did not find that the Trump campaign, or anyone associated with it, conspired or coordinated with the Russian government in these efforts, despite multiple offers from Russian-affiliated individuals to assist the Trump campaign,” Barr wrote to congressional leaders in his four-page summary of Mueller’s report. 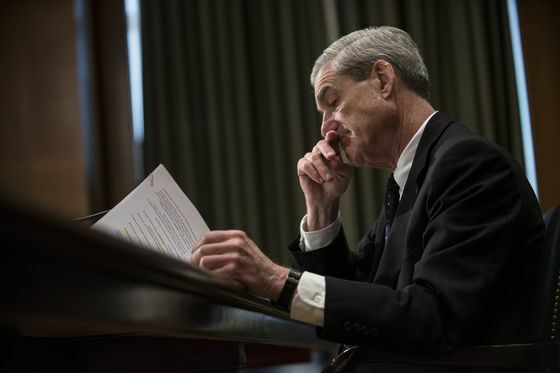 Still, Barr’s summary is unlikely to quell congressional investigations into Trump and his inner circle, and several criminal investigations are proceeding by federal prosecutors outside of Mueller’s office. Justice Department policy prohibits prosecutors from indicting a sitting president and restricts releasing material on people not charged, providing an opening for Democrats to demand further disclosure and keep pressure on the White House. House Judiciary Chairman Jerrold Nadler, a Democrat, has described “an administration run amok,” and issued a sweeping request for documents from 81 individuals, agencies and entities, including the president’s son Donald Trump Jr., Trump Organization Chief Financial Officer Allen Weisselberg, and the publisher of the National Enquirer, David Pecker. Trump’s inner circle faces broader legal jeopardy from investigations by federal prosecutors and state attorneys general. Trump’s company, campaign, inaugural committee and charity are all under investigation. Barr’s summary included three paragraphs on Russian interference, with the attorney general saying he would release a more complete summary of the report after removing grand jury material that can’t be made public. In previous court filings, Mueller laid out the framework of what Trump’s critics saw as a collusion case against the president and his aides and supporters. That story begins in 2014 when a so-called troll farm based in St. Petersburg, the Internet Research Agency, developed an information warfare strategy to sow political discord in the U.S. Russians used phony online identities to tear down Clinton and other Trump rivals, while touting Trump and inflaming hatred of Black Lives Matter and Muslims. Efforts also took place offline. They arranged grassroots rallies. A Russian troll, impersonating an American, asked someone in the U.S. to build a cage on a flatbed truck, while hiring someone else to wear a costume depicting Clinton in a prison uniform. An indictment against 13 Russians involved in the effort was careful to note that they took advantage of Americans, including some associated with Trump’s campaign, who were unwitting. A later effort by the Russians to hack Democratic emails drew interest from Trump’s campaign staff and supporters. In 2016, Russia’s military intelligence agency, known as the GRU, set out to hack emails and documents from the Clinton campaign, its chairman John Podesta, and the Democratic National Committee. Stolen documents, including those from Podesta, were transferred to WikiLeaks, the anti-secrecy organization founded by Julian Assange. WikiLeaks released emails at strategic times -- including just before the Democratic National Convention and just after the Washington Post released a 2005 audiotape of candidate Trump boasting about sexually assaulting women. At roughly the same time, Trump associates were getting wind of just the sort of information the Russians were dredging up. Some in the candidate’s circle sought damaging information on Clinton, including hacked emails. In June 2016, Donald Trump Jr. attended a meeting at Trump Tower with several Russians based on a promise of “dirt’’ on Clinton. Russian lawyer Natalia Veselnitskaya and lobbyist Rinat Akhmetshin were there, as was Trump’s son-in-law Jared Kushner and his campaign chairman, Paul Manafort. Veselnitskaya told Bloomberg News that Trump Jr. indicated at the meeting that a law targeting Russia could be re-examined if his father won. Trump himself famously looked into the camera with a plea for emails from Clinton’s private server. “Russia, if you’re listening, I hope you’re able to find the 30,000 emails that are missing,” he said on July 27, 2016. It was the very day, according to a Mueller indictment, that the Russian military intelligence squad made its first attempt to hack a domain used by Clinton’s personal office. And then there was Roger Stone. Mueller laid out, in two indictments, Stone’s efforts to obtain emails and voter data hacked from the Democrats, including an instance in which Stone reached out to an online persona who Mueller later said turned out to be a front for Russian state hackers. Stone also claimed publicly that he had communicated with Julian Assange, whose antisecrecy group WikiLeaks was publishing purloined emails from Democrats. Mueller has charged Stone with making false statements, obstructing the congressional investigation, and witness tampering. He’s pleaded not guilty. Barr’s letter confirmed that Mueller elected not to bring further charges against anyone.